Steve Davison, author of the new walking guidebook to the North Wessex Downs, gives us ten highlights of this beautiful area. The North Wessex Downs is the third largest area of outstanding natural beauty in the UK. 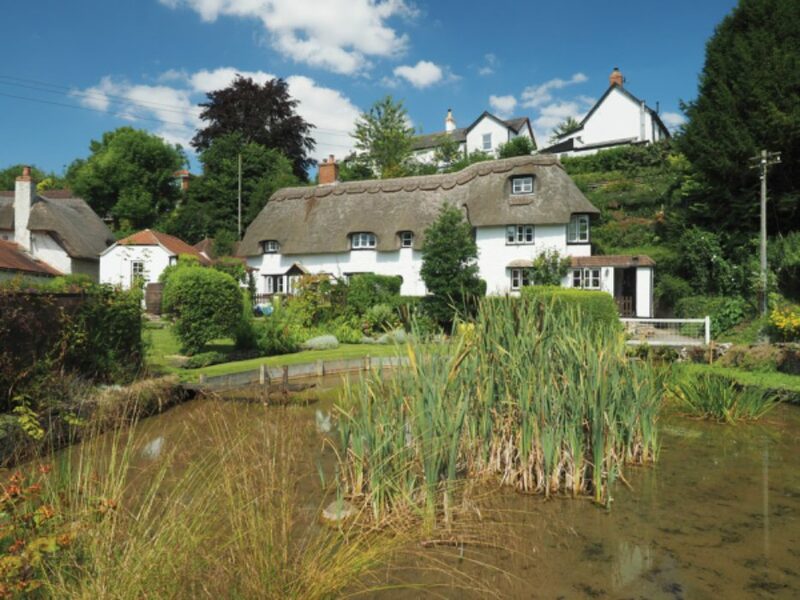 If that one fact on its own is not enough to tempt you to visit this quintessentially English landscape of gently rolling hills and undulating chalklands then read on. 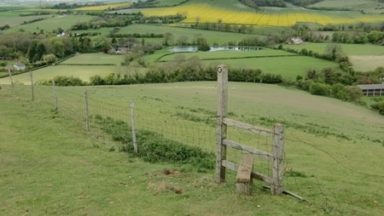 Steve Davison, author of the new walking guidebook to the area, gives us ten highlights of the North Wessex Downs. 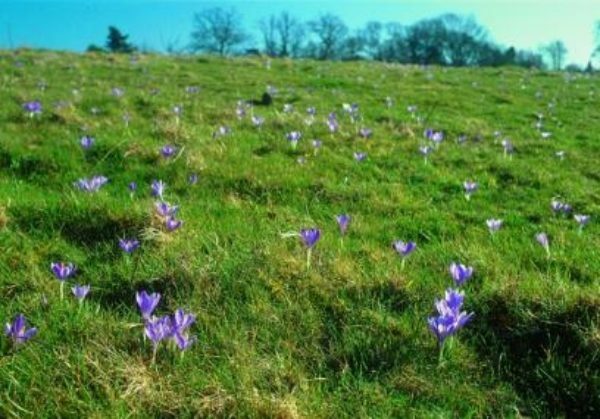 Although the downs are termed ‘hilly’, they don’t rise to any great height, which makes the walks here suitable for a wide range of abilities. 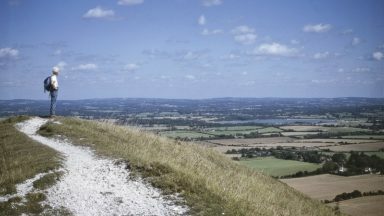 Nevertheless, the walks in this guide take in not only the aforementioned highest chalk hill in England (and highest point in Berkshire), Walbury Hill (297m; Walk 26), but also the highest points in three other counties – Milk Hill in Wiltshire (295m; Walk 21), Pilot Hill in Hampshire (286m; Walk 27) and Whitehorse Hill in Oxfordshire (262m; Walk 11). 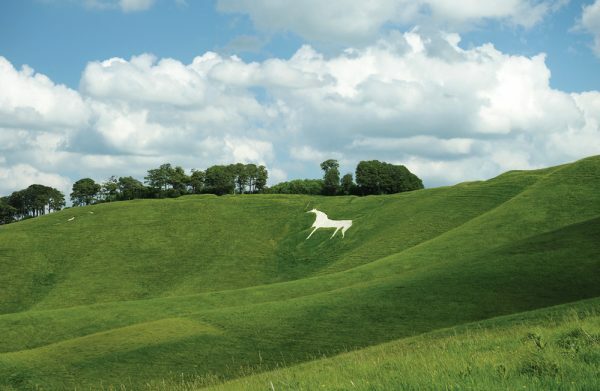 There are several white horses of interest in this area but the oldest, and perhaps most famous, is the 3000-year-old stylised galloping figure of the Uffington White Horse encountered in Walk 11. The small, flat-topped mound of Dragon Hill, beneath the White Horse, is where St George is reputed to have killed the dragon. The steep-sided coombe, or dry valley, to the left (west) of Dragon Hill is known as The Manger, and legend has it that the White Horse goes there to feed. Avebury is the site of one of the largest henge monuments in Britain and can be enjoyed in Walk 18. Dating from 2600bc, the most impressive feature at Avebury is the large henge. This type of Neolithic earthwork consists of a circular or oval outer bank and an inner ditch (unlike a defensive Iron Age hill fort, which has an inner bank and outer ditch). Within this structure is an outer stone circle, one of Europe’s largest stone circles, originally marked with 98 sarsen stones, as well as two smaller stone circles and part of the present village. 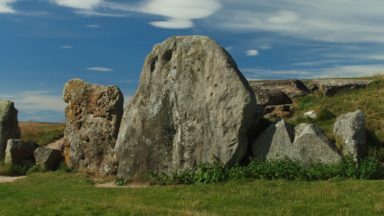 Along with Stonehenge, the Avebury henge and associated sites have been designated a World Heritage Site. Linking the henge with The Sanctuary is the West Kennet Avenue, which originally consisted of 100 pairs of standing stones. A number of long-distance paths run through the North Wessex Downs AONB, including significant sections of the Lambourn Valley Way and the Ridgeway. 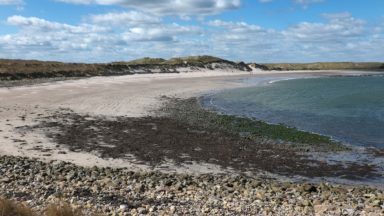 Some of these paths intersect with walks in this guide (see below), and offer the opportunity for walkers to create their own longer route. Lambourn Valley Way: A 32km (20-mile) route from the Ridgeway at the Whitehorse Hill car park along the Lambourn Valley to Newbury, passing through Lambourn, Eastbury, East Garston, Great Shefford and Boxford. Crosses Walk 8 and Walk 9. 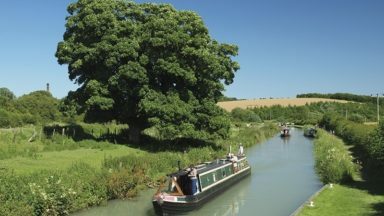 Ridgeway National Trail: The southern section of the trail from Overton Hill near Avebury to the River Thames at Streatley travels for 68km (42¼ miles) along the northern scarp of the North Wessex Downs. Crosses Walks 3, 5, 6, 10, 11, 12, 16, 17 and Walk 18. Test Way: Follows the Test Valley from Eling Wharf on the outskirts of Southampton to end at Inkpen Beacon (73km/45 miles). 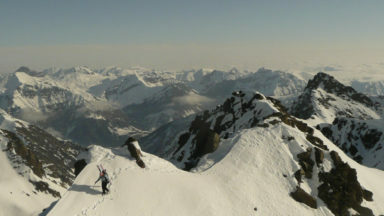 Crosses Walk 26 and 28. Wayfarer’s Walk: A route through Hampshire from Inkpen Beacon to Emsworth (114km/71 miles). Crosses Walk 26, 27, 29 and 30. 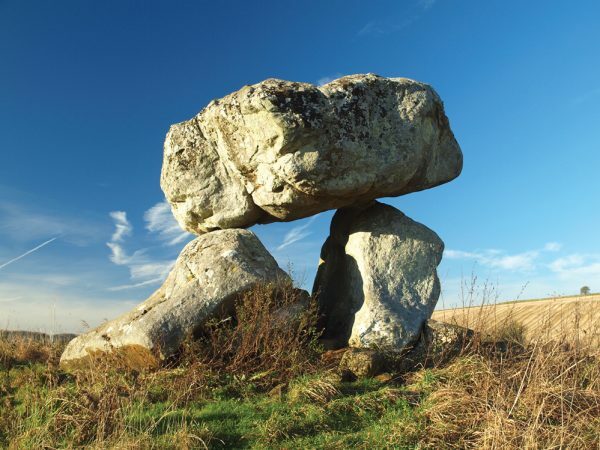 White Horse Trail: A route visiting all eight white-horse hill figures within Wiltshire, seven of which are within the North Wessex Downs (145km/90 miles). Crosses Walks 15, 16, 17 and 18, 19, 20, 21 and 23. 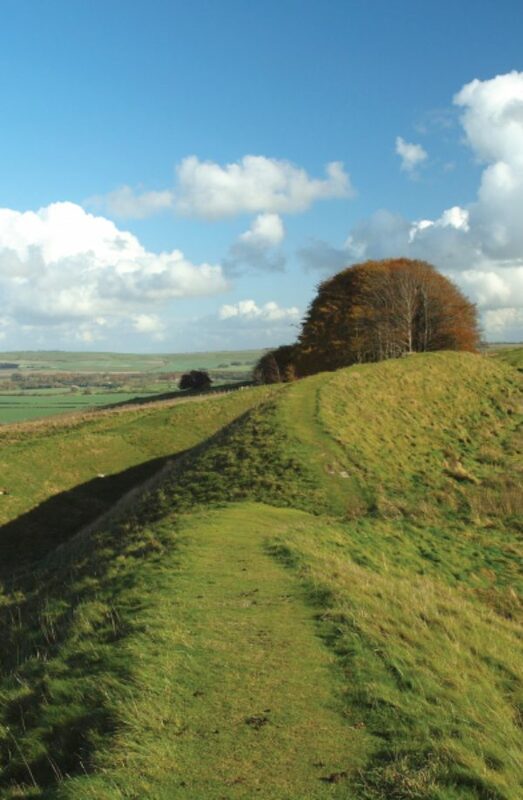 Great Stones Way: A route from Barbury Castle to Old Sarum, with detours to Avebury, Stonehenge and Salisbury (58.5km/36 miles or 85.7km/53 miles). Crosses Walks 17, 18 and 21. Brenda Parker Way: A 126km (78 mile) route developed by the North Hampshire Ramblers Group running between Andover and Aldershot. Crosses Walks 27 and 28. East Hendred (Walk 7), the larger of the two Hendred villages, has a wealth of 16th- and 17th-century brick and timber-framed houses, including a fine example of Tudor brickwork at the village shop. Hendred House, based round a 15th-century hall house, was passed to the Eystons through marriage in the 15th century and it has been their family home ever since. The family are related by marriage to Sir Thomas More, one-time Chancellor to Henry VIII, who was executed along with John Fisher, Bishop of Rochester, in 1535. The Church of St Augustine of Canterbury has an interesting, but hidden, faceless clock. Built in 1525 by John Seymour of Wantage it is one of the oldest clocks in England, and still chimes the hours and quarters as it has for almost 500 years, while every three hours it plays the ‘Angel’s song’ by Orlando Gibbons. The small but interesting Champs Chapel Museum is housed is the former 15th-century Chapel of Jesus of Bethlehem built by Carthusian monks from Sheen, Surrey (open Sunday afternoons during the summer). Picturesque Lambourn (Walk 9), said to have been the model for Maryland in Thomas Hardy’s novel Jude the Obscure, is centred around St Michael and all Angels Church and the adjoining Market Place, complete with its old stone market cross from the reign of Henry VI. Parts of the church, which is based on a typical cruciform design with a central tower, date back to Norman times. Inside there are several notable monuments, including the impressive alabaster tomb of Sir Thomas Essex of Lambourn Place (d.1558) and his wife, Margaret. Behind the church is the red-brick castellated entrance to the Isbury Almshouses, originally built by John Estbury in 1502. The North Wessex Downs Area of Outstanding Natural Beauty (AONB), the third largest AONB in England, covers an area of 1730 sq km and takes in parts of four counties – Berkshire, Hampshire, Oxfordshire and Wiltshire. It encompasses one of the largest and least developed tracts of chalk downland in southern England. 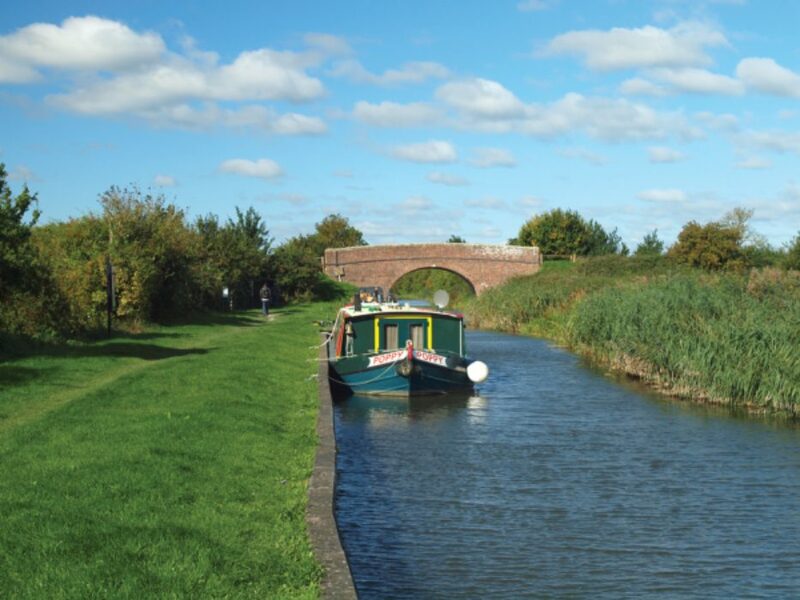 The Kennet and Avon Canal, which opened in 1810, provided a transport link between Bristol and the River Thames at Reading until the development of much faster railway links brought about its gradual decline. Fortunately, after years of neglect the canal has now been fully restored. The North Wessex Downs are easily accessible from London, Reading, Basingstoke, Swindon and Bristol. Why not give them a go? 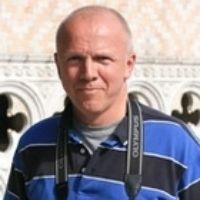 Steve Davison's guidebook is published by Cicerone and is available direct from the publisher or all good bookshops.